In this tutorial you will learn how to make an m3a file with an animation for an existing model. As tool we will use the open source software Blender together with my m3addon. For installation instruction please have a look at the readme file of my m3addon. If you want to make a tutorial on how to install my m3addon feel free to contact me. Cheers. We need more people dedicated on modeling in this community. Keep it up. Maybe upload your video's to youtube and embed them into the forum? I haven't uploaded the videos to youtube since I don't like that google collects so much data. If curse would support it, the video I uploaded could also be embedded in the forum via HTML 5. Wow, it sounds rather simple. HUGE thanks for this tutorial, It might be really helpfull for me in the future. So, let me get this straight: This would allow you to create, for example, a .m3a file holding a throw grenade animation for a marine, which you could import to your map and add to your marine, without having to edit the original model? I have no modeling experience at all, but if I understood this correctly, this sounds awesome. Imagine all the models with lacking animation sets out there! There are so many of them. € after a first glimpse of the example you added, this seems to be exactly, what it is. Yes, you could make a throw animation, save it as a small m3a file. The cool thing about making m3a files instead of just modifing models is, that you can make them so small: You don't need to include the mesh, attachment points nor all the other animations. Well, this will certainly make all those SM models alot more useful. Any player made models that I tried to load up (including models converted from WoW). Any SM (Storymode) Model that i tried to load up (which is a real shame). Ive tested the SM Marine and SM Marauder. Novas model (weirdly enough, Echos model worked). The melee game models seem to work all fine, though. I might get the error messages later. Oh, btw, I made a new standing animation for Nova and Echo (they share the same bones), however, there is a small bug with the right arm that I cant explain. Can I give you the file and you take alook at it? SM_Marine01 and SM_Nova import now properly. The SM_Marauder model can be imported without error messages too, but somehow some parts of the marauder are missing. About the animation you made: I can have a look at it, but it might take a while till I find some free time for it. What is the animation for? The animation I made is for nothing, actually. Its just for practice. The problem is that the right arm is not where its supposed to be, but slightly off, which basically makes the gun float in the air. You can see what I mean when you compare the animation in blender with what actually shows up in the previewer in the editor. Edit: I also have a question regarding attachment points. Do they remain intact? As in, are stuff that I attach to specific attachment points still in the right place when I use a custom animation? Or do I have to animate the attachment points seperatly? Edit 2: More importantly, what do I need to keep in mind when I make an animation from scratch? I just did an animation for SM_Marine, unfortanly, It didnt work when i loaded it up into the editor. I also attached that one. Oh nice, didn't you can add m3a files in the previewer to models. That's a really nice feature. I played around with creating nova animations and they seem right. In the blend file you attached there is no model so I can't confirm that the gun is actually in novas hand in Blender. But I suggest you don't post the whole model here because Blizzard has the copyright. About attachment points: Their location and rotation and scale get represented by bones. So if you make a animation for a model you always make at the same time an animation for the attachment points of a model. There was a bug in the importer. It didn't imported the animation ids of unanimated bone properties. As a result you couldn't animate bones that weren't animated. 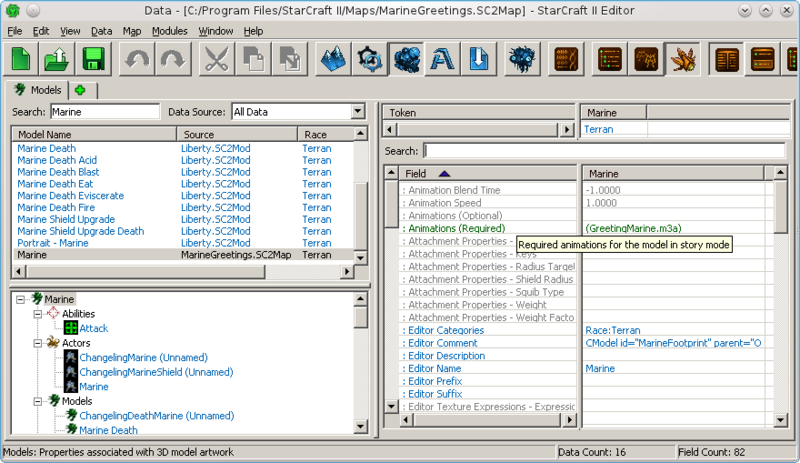 So if you want to animate the marine model you need to import the marine again with the updated version of the importer. Maybe the gun's relative position of your nova animation wasn't animated too and it's animation id didn't get imported. Anyway, I made a marine wave animation for the story mode marine 01. Importimg m3a files as seperate model works now too. So you can open my attached animation and change it if you wanted too. Wow, thank you so much. Will try it out today. The attachment point thing sounds awesome, wouldnt have expected it to be so easy. Just tested it and the SM_Marine works! I cant thank you enough. One question though: When I make an animation from scratch, how can I set the point where I want it to end? Right now, the stuff ive animation plays perfectly, but after that the character just freezes (cause ive not animated him any further) and the animation keeps going for a few seconds, but the animation doesnt end where I want it to end. How can I archieve that? 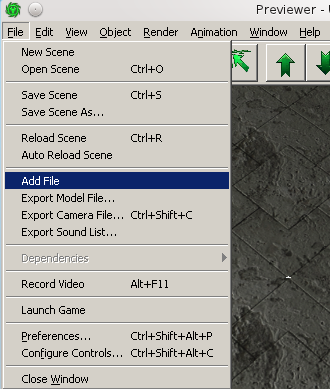 In the time line editor (per default visible at the bottom) you can set the start and end frame for the currently selected m3 animation. If Blender is configured to have 30 frames per second (automatically done when you import a m3) then a frame range 0 -59 would represent a 2 second long animation. Great, that will be really helpfull. I just now completed my first little "project" using custom animation. It will be online today or tomorrow. Would love to see some videos of this stuff. I'm working on making an aberration hero, but the unit is really lacking any cool actor animations. Do you mean tutorial videos or videos of how an animated model looks like? Videos for both are linked in the first post. The marine_03 model is also not working, but I would really like it to work. It has a similar error as the marine_01 model had, I would post the error log, but I dont know how to copy it.